The region has made significant progress in reducing greenhouse gas (GHG) emissions, but even with cleaner fuels and better technology, we will not be able to reach the goal that has been adopted by all three states and New York City of reducing emissions by 80 percent by 2050. To accomplish this, we must significantly strengthen the existing carbon pricing system of the Regional Greenhouse Gas Initiative (RGGI). Using the California model, which covers all greenhouse gases and includes transportation, buildings, and industry, as well as power generation, would result in much deeper reductions in greenhouse gases. Joining RGGI with California’s market would create an even more effective program. Revenue generated from the expanded market should be invested in an equitable, low-carbon economy. New York, New Jersey, and Connecticut have each participated in the Regional Greenhouse Gas Initiative, a compact of nine northeastern states intended to combat climate change through a mandatory market-based cap-and-trade program. RGGI sets a cap on carbon pollution from the region’s power plants. The cap declines every year, and has played a major role in reducing pollution from the power sector in participating states by 40 percent since 2009. But RGGI only regulates emissions from carbon dioxide, despite methane and other gases also contributing to climate change. RGGI also regulates emissions only from the electric-power-generation sector, when other sectors of the economy contribute significantly to emissions, including the transportation, residential, commercial, and industrial sectors. At a time when the federal government is retreating from reducing emissions, a more aggressive regional approach is critical. The cap-and-trade market in effect in New York and Connecticut today regulates carbon emissions only from the power sector, which represents just a small part of all emissions in the region. RGGI should be expanded to include all three states, as well as emissions from the transportation, indutrial, residential and commercial sectors. RGGI’s effect on emissions would be much greater if it regulated all GHG and all economic sectors. The revenue it produces could also be invested in efforts to accelerate the transition to a greener economy. California’s cap-and-trade program, which covers both all greenhouse gas emissions and major sectors of the state’s economy, provides a model that RGGI can adopt and join. In New York, New Jersey, and Connecticut, motorized vehicles account for a third to nearly half of all carbon emissions. Five states and the District of Columbia, including New York and Connecticut, are already collaborating to develop market-based carbon-reduction policies under the auspices of the Transportation and Climate Initiative (TCI), a collaboration of 12 northeastern and mid-Atlantic states. Research shows that a pricing policy, such as a carbon fee or mileage-based user fees, could reduce carbon emissions by 32 to 40 percent by 2030. RGGI should expand its carbon market to include transportation fuels. If RGGI does not, then New York, Connecticut, and New Jersey should join with other willing states to implement transportation pricing policies. New York, New Jersey, and Connecticut should work with RGGI, or on their own, to expand the cap-and-trade market to include large industrial emitters and the suppliers of heating fuels, which are the primary sources of emissions in residential and commercial buildings. Like California’s cap-and-trade program, fuel suppliers should be required to reduce greenhouse gas emissions by supplying low greenhouse gas fuels or by purchasing allowances to cover the greenhouse gases they produce. Including the industrial sector would also provide the opportunity to expand coverage to gases other than carbon dioxide, including methane, nitrous oxide, and numerous fluoridated greenhouse gases. Ideally, the market for addressing greenhouse gas emissions would be national or international, with all emitters participating and following the same procedures. With little chance of a national market being established in the near future, states and international partners can still create a market that would cover a large share of the North American economy. 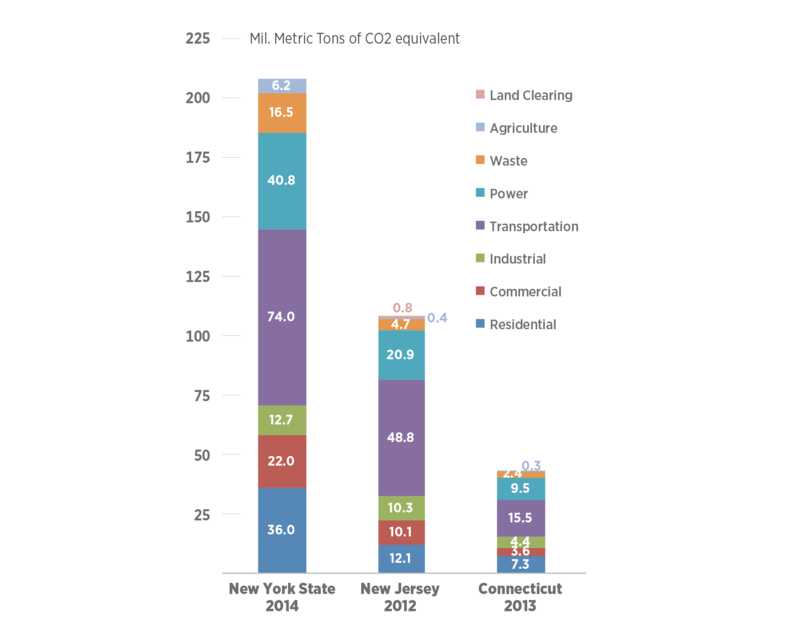 New York and Connecticut currently participate in RGGI’s cap-and-trade program, while New Jersey, which was an original RGGI state, withdrew in 2011 but should rejoin immediately. The initiative should also take steps to link with the joint cap-and-trade program that currently exists between California and the Canadian provinces of Quebec and Ontario. Such an alliance would include states and provinces with a combined economy that is close to half the size of the United States economy. The two initiatives have already begun sharing information and borrowing from each other’s program design, but the process should be accelerated to advance a model that can meet the objectives of steep GHG reductions. Expanding greenhouse gas pricing to the transportation, residential, commercial, and industrial sectors would generate significant funds for the region and other market participants. To date, RGGI auctions have generated $2.78 billion in proceeds—nearly half of it was generated by New York, Connecticut, and New Jersey—much of which has been invested into energy efficiency, clean and renewable energy, direct bill assistance, and greenhouse gas sequestration. Based on California’s experience and other estimates, as much as $3 billion annually could be raised by the three states. California’s program, which includes electricity and industry as well as ground transportation and heating fuels, is projected to raise between $2 billion and $4 billion annually by 2020, and as much as $5 billion by 2025. California’s population and economy are similar in size to the nine-state RGGI region—of which New York, New Jersey, and Connecticut account for half of the revenues generated—so comparable policies here could generate up to $2.5 billion. Other estimates for the transportation sector alone indicate that pricing could produce even greater revenue. The Georgetown Climate Center study—for TCI, by Cambridge Systematics—estimated that capping transportation emissions alone could generate between $1.5 billion and $6 billion annually for the 11 states and District of Columbia that participate in the TCI, depending on the price set for emissions. This could translate to revenues of up to $3 billion for New York, New Jersey, and Connecticut from this sector alone. Similar to California, revenue should be invested in places and sectors that reduce GHG emissions even further while creating a strong and equitable economy that benefits those who have been harmed most by carbon emissions and would be burdened most by increased costs passed down to consumers. Expand and modernize the region’s transportation infrastructure to boost ridership and lower vehicle emissions. One of the most effective ways to reduce vehicle emissions is to boost ridership on mass transit. Provide incentives for electric vehicles and infrastructure. Demand for electric—and other alternative fuel vehicles—is on the rise, but the additional cost and lack of supportive infrastructure limit the number of vehicles on the road. Build resilience to climate change for critical infrastructure. Our critical infrastructure—including energy, wastewater, and transportation—still remains very much at risk from flooding and extreme temperatures caused by greenhouse gases. Invest in building sustainable, complete neighborhoods to reduce reliance on automobiles. Invest in energy rebates and improvements in neighborhoods that have been disproportionately burdened by carbon emissions and facilities. Low-income neighborhoods and communities of color have disproportionately borne the burden and environmental injustice of hosting infrastructure with local environmental impacts, such as power plants, waste-transfer stations, bus depots, etc., which directly affects the health of their residents. Invest in natural carbon sequestration by restoring and improving the management of natural systems, such as forests and coastal wetlands, that serve as carbon filters that remove carbon dioxide from the atmosphere and store it. The U.S. Forest Service estimates that forests offset approximately 10 to 20 percent of U.S. carbon emissions annually. An expanded greenhouse gas market will have multiple positive outcomes, most importantly the reduction of greenhouse gas emissions that contribute to climate change. By linking to other greenhouse gas markets, such as California-Ontario-Quebec, we will gain momentum toward a nationwide market. The use of a single valuation of GHGs across jurisdictions will provide incentives to implement the lowest-cost emission reductions first and offer a larger portfolio of options for emissions reductions to create a more certain market. Proceeds from the market could be used for critical investments that advance better transit, boost the electrification of our automobiles, ensure the viability of critical infrastructure and natural systems, and create more sustainable and equitable communities. The costs for expanding the greenhouse gas market in our region would be covered largely by the emitters or suppliers of the greenhouse gases in the market. It is likely that some of these costs would be passed on to consumers (e.g., transportation or home heating fuel prices may rise to reflect higher costs paid by fuel suppliers). Anything passed on to consumers would likely be regressive because it would take a larger percentage from low and moderate incomes. States should ensure low and moderate income populations are protected from such increases through existing or new regulations. Investments of proceeds back into these communities, particularly low-income and working-class communities, could also help to offset any additional costs.